Great first week of matches! 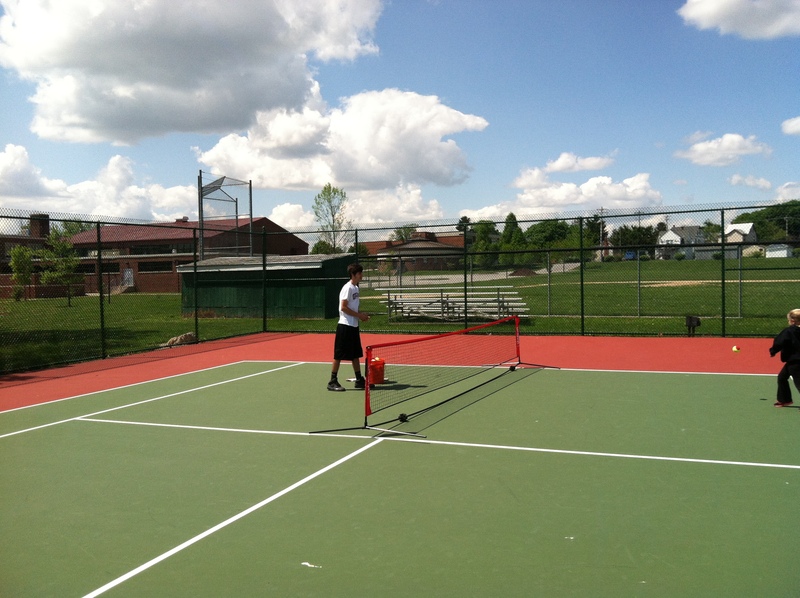 Of course, we had the trademark Oxford Hill wind, but regardless, it was a beautiful day for tennis on Sunday, May 18th. The PATTA Oxford veterans were ready to get back out there and earn some games for their teams, and those who were new to match play were ready to try it out. The parents and families were ready with their front row lawn chair seats, only a few feet from the action (an Oxford PATTA crowd trademark which is great). Overall, I was impressed with the level of patience, fun, and sportsmanship I saw out there in what was the first match experience for many out there. Coaching Staff: Justin Landis (Deputy Director), Greg Ruark (Assistant League Manager), as well as Jared and Erik (2 varsity tennis players from Oxford High School). Rules: For the 11-14 division (as well as the 10 and under division), they will play first to win 4 total games. At 3-3, they’ll play a first to 5 point tiebreak, alternating serves. For the 8 and under division, they’ll play best 2 out of 3 sets, and the sets will be first to win 7 points (win by 1). After each set, the players, switch ends. 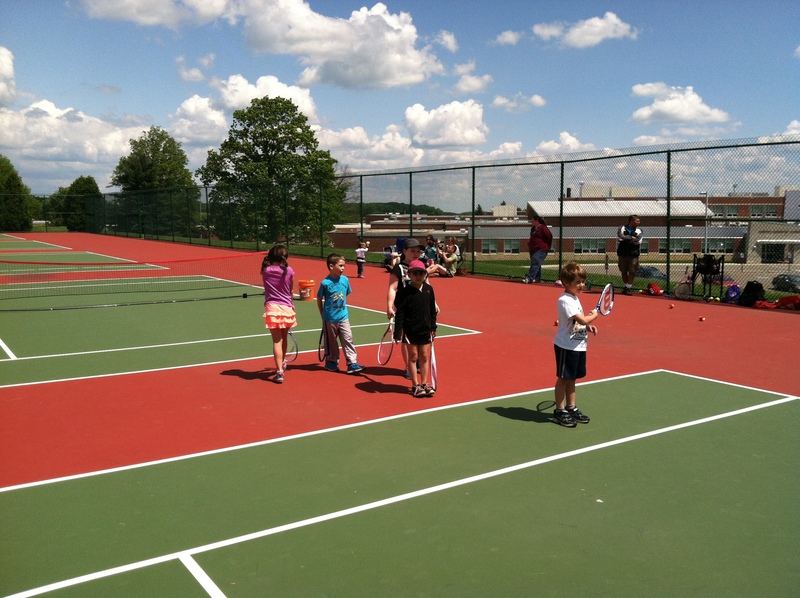 Practice Court: When players aren’t involved in matches, they will be playing on a practice court, which is usually run by one of our junior instructors. 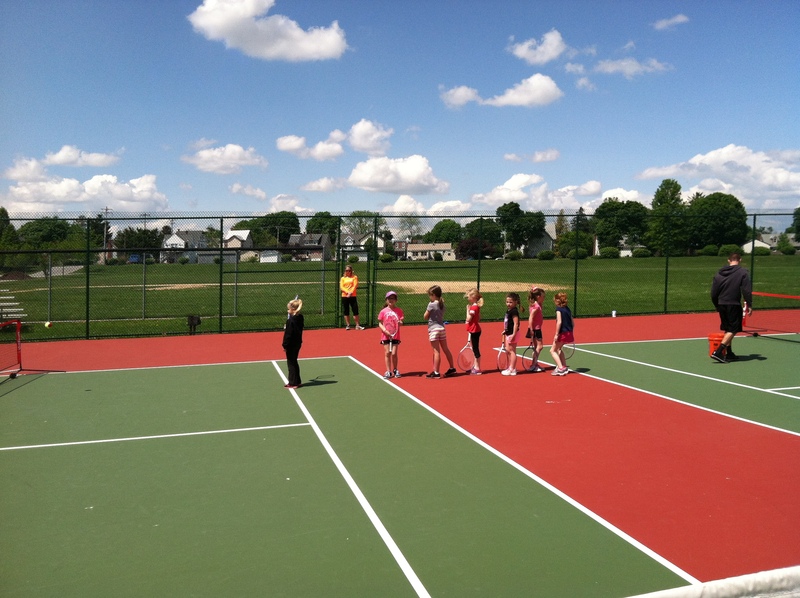 On the practice court, the players will get to play some fun tennis themed games, such as “jail” and “king of the court.” If the players are confident in their scorekeeping abilities and match experience, we may send a few off to play exhibition matches on their own as well. Exhibition Matches: Once all the required team matches are completed, if we have some time to spare, we put out some exhibition matches. These are supervised by the coaches, and allow the players to get some valuable match experience in both singles and doubles. Although these matches don’t result in points for their team, they’re still a good experience for them to build confidence in their match play abilities. Lewis and Karina of the yellow team got things started strong with a 4-0 win over Aiden and Nicole of the blue team at first doubles. At second doubles, Rachel and Abby (also representing yellow) earned a solid 4-1 victory over Carter and Amelia. 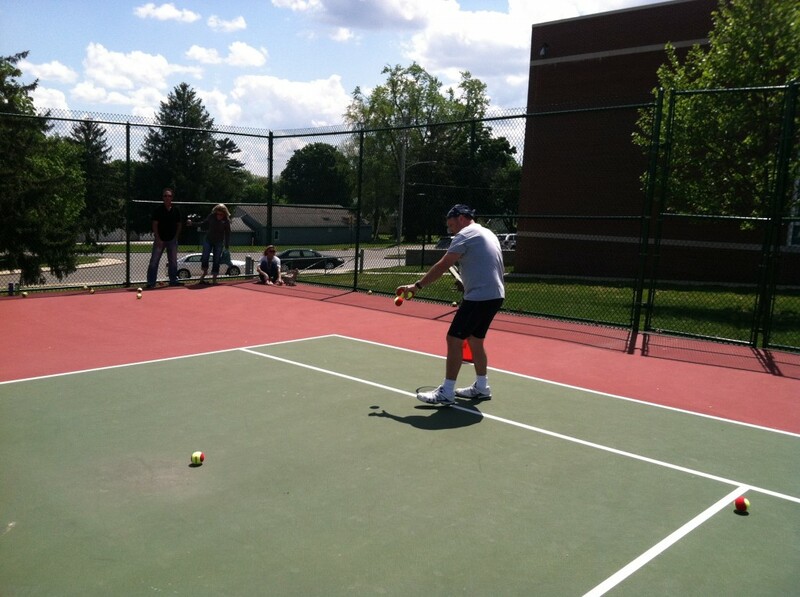 The singles matches saw some experienced, athletic players going head to head against each other here. At first singles, Steven H (yellow) won an impressive victory over Abby C. (blue) by a score of 4-1. However, in second singles, Abby’s sister, Charlotte avenged the loss with a 4-1 win over Connor R. of the yellow team. This one had some close matches. The first doubles matchup between Rachel and Courtney (lime) and the sister duo of Madison and Maria (red) ended in a 3-3 tie after we called the match. At second doubles, Kate and Leah earned a 4-1 win over Connor E. and Gabby. At first singles, Reed had some nice gets and consistent shots, earning a 4-0 win against Zach, who played well for his first ever tennis match experience. At second singles, Leah was leading Connor E. by a score of 3-2 at the time of stoppage. This match resulted in the first ever tie of the spring season, with a final score of 10 to 10. This division is played on a 60 foot court with balls that are orange and slightly lower in compression to ensure that the players will learn how to construct points, anticipate shots, develop solid mechanics, and have fun. There were a lot of close matches here in the 10u division, and things started with a nail biter at 1st doubles. In this matchup, Morgan and Jennifer of the blue defeated Noah and James of yellow 4-3, serving their way to a solid win. At first singles, Jennifer and Samantha were at a 1-1 tie when the time was up, and Jennifer hit what was probably the shot of the day, sprinting to return a short serve by Samantha and blasting it up the line for a great winner. At second singles, we had another tiebreak match. James of yellow narrowly defeated Erik of blue by a score of 4-3 in a match that saw both players gradually start to get more and more serves in play. Another tie here! Each team won 8 sets in the second tie out of 3 total matches so far. Another matchup of very close sets here. Coach Greg’s court always seemed to result in tiebreak sets! In this one, Eris and Alyssa of lime narrowly edged out Maya and Madeline of red 4-3. First singles was yet another tiebreak, with Madeline of red defeating Ian of lime by a score of 4-3. In this match, both players really started to get the scorekeeping and started to develop a bit of strategy on their serves. Great job! In the second singles matchup, Alyssa of lime defeated Maya of red by a score of 4-0, despite some greatly improved serving by Maya. In this division, we combined the 6 and under players with the 8 and under players, which resulted in a fun mix of ages and experience levels. But from my personal experience, once the serves started going in, the points definitely got interesting! First doubles was a fun match full of excited young players. In this matchup supervised by Coach Greg, Abby and Dylan of blue defeated Sydney and Joseph of yellow 7-2, 7-6. At second doubles, the young team of Cailin and Abby played well together, winning 7-2, 5-7, 7-6 against another young team of Mason and Joseph. In singles, I supervised the matchup of Dylan and Avani, and they had some very consistent serves and a few good rallies too! In this matchup of more experienced young players, Avani took the win for yellow by a score of 7-3, 5-7, 7-2. The second singles match, Alice won by a score of 7-1, 7-2 over Cailin of blue. I caught a few rallies of this match, and i saw a few great, high shots by Cailin despite the score! A lot of 3 set matches in this one here. Lily and Meghan started things off strong for the lime team, earning a 7-3, 6-7, 7-3 win over Madeline and Cara of red. At second doubles we had another 3 setter, with Cael and Nikhil of red earning the win over the sister duo of Charlotte and Emily, winning 7-3 in the third set. At singles, Madeline defeated Meghan by a score of 7-3, 7-3 and Nikhil just barely earned the win over Emily, earning it by a narrow 4-7, 7-3, 7-6 margin.